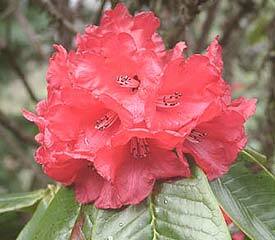 Flower/Truss Description: Tubular campanulate, brick-red, rarely pink. Compact truss holds 10-15 flowers. Foliage Description: Leaves broadly obovate to elliptic, up to 6" long, purplish when young. Height: 5 feet in 10 years.